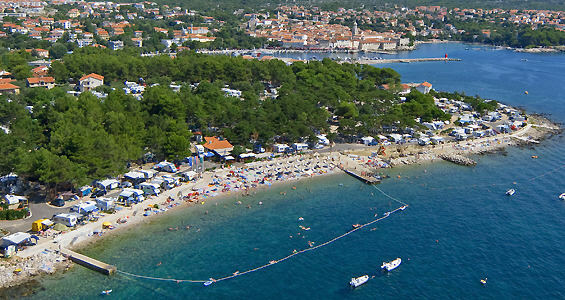 The Island of Krk has many nice beaches, with Baska beach also being one of the most beautiful beaches of Croatia. 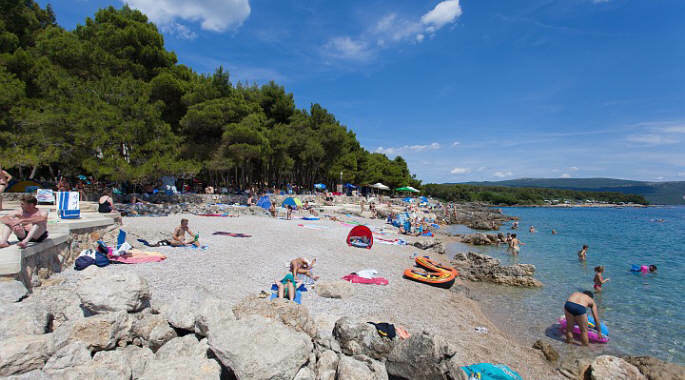 Beach areas ranges from fine or more coarse pebbles, sand beaches, rocky beaches through to man-made paved bathing areas. 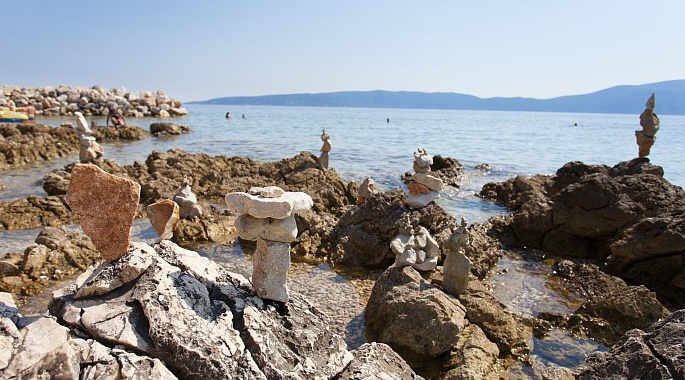 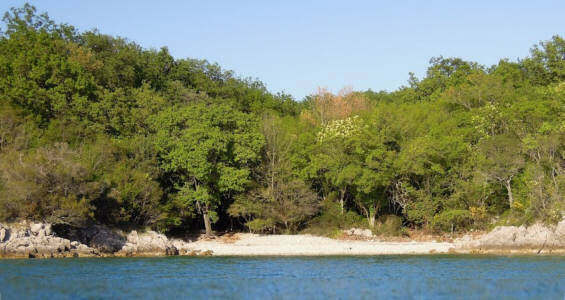 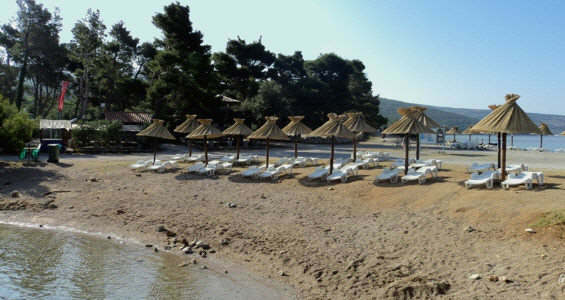 There are a few sandy beaches on the Krk island as well as a beach in a large Soline bay known on its healing mud. 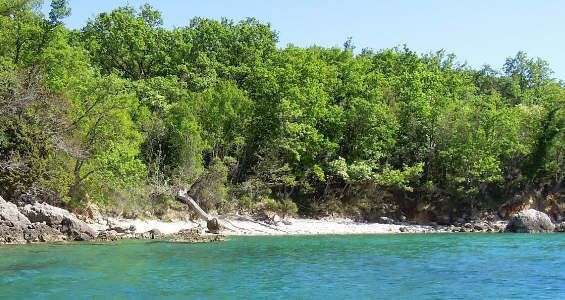 Some beaches are in the secluded coves, accessible only by boat or sometimes by foot using the narrow pathways leading through island vegetation. 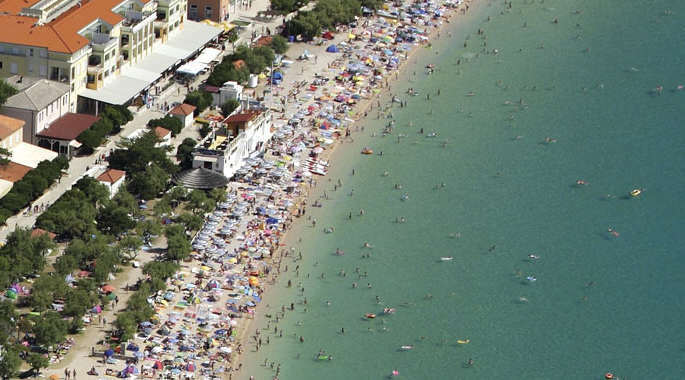 Many beaches are awarded Blue Flag which symbolises a cleanness of the sea and a safe and pleasant beach and holiday environment. 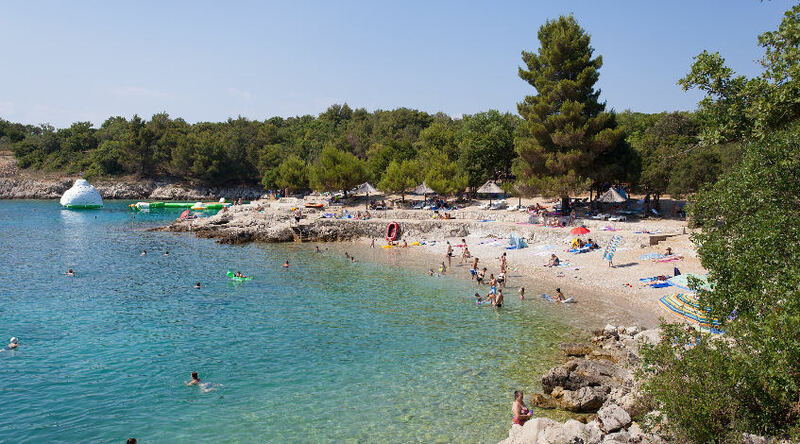 Most "wild" beaches do not have blue flag purely because they have not been tested, but the sea along these beaches is usually just as clear and clean as the organised beaches with the blue flag. 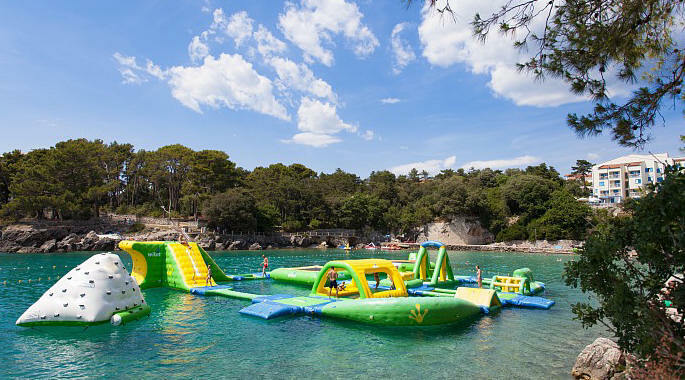 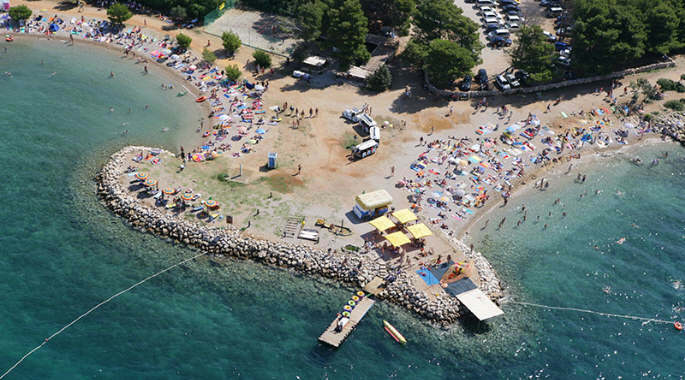 This beach is located to the west of the Krk town centre, towards the campsite Jezevac. 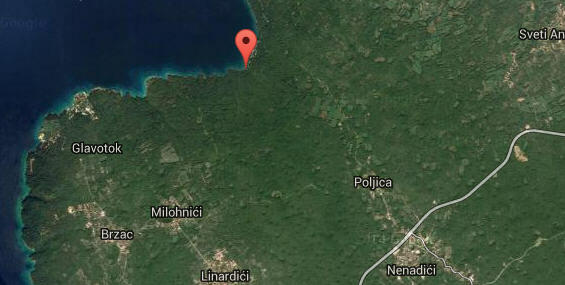 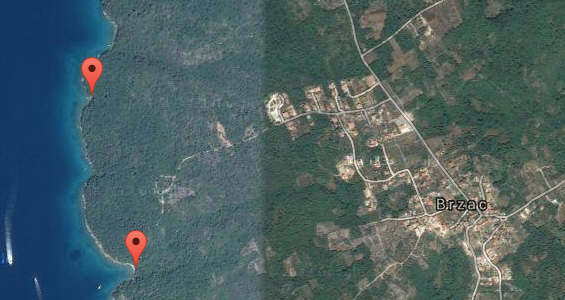 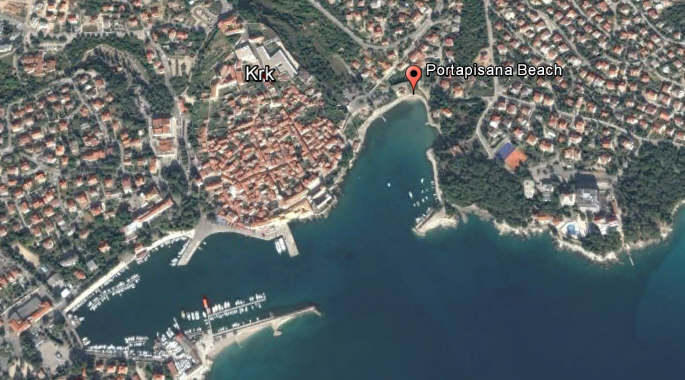 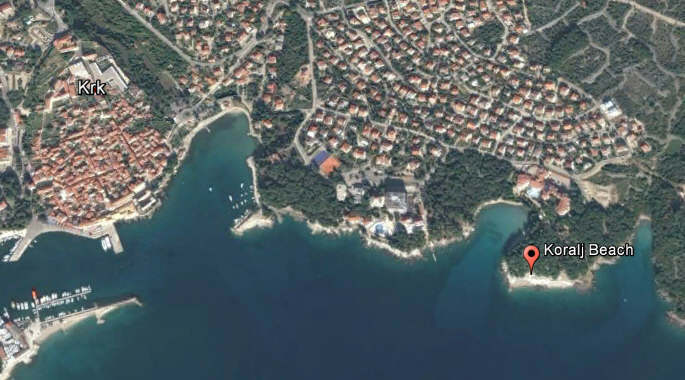 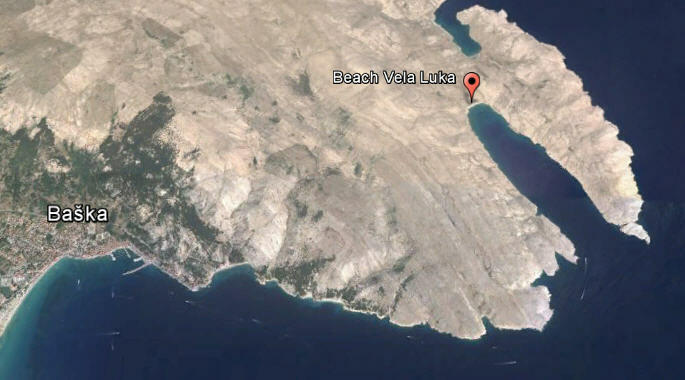 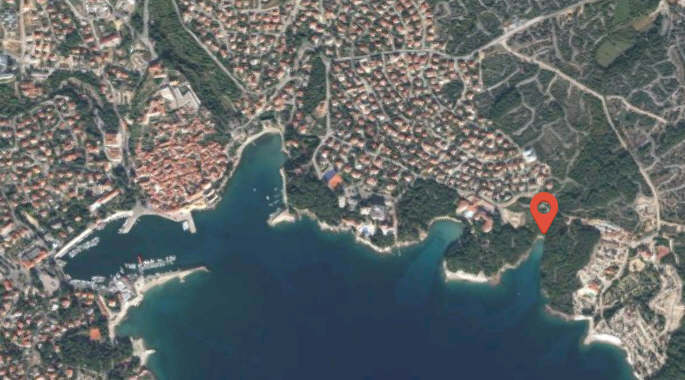 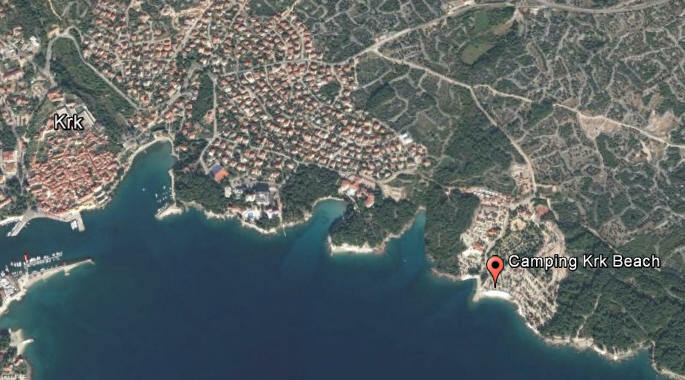 The distance from the Krk town to Porporela beach is only 5 minutes walk. 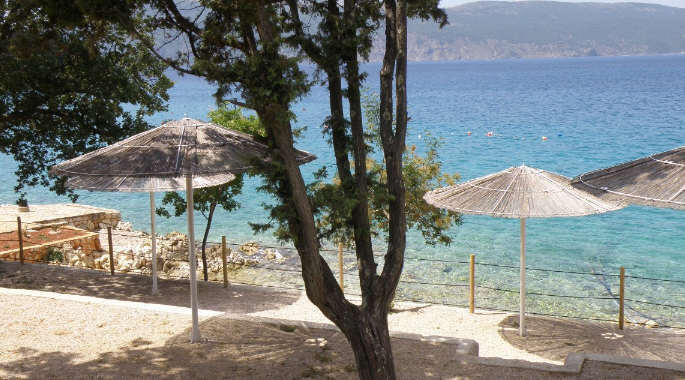 Situated in a deeply carved cove in front of the Hotel Koralj, the beach has a sandy seabed and also offers a shade in a surrounding pine trees. 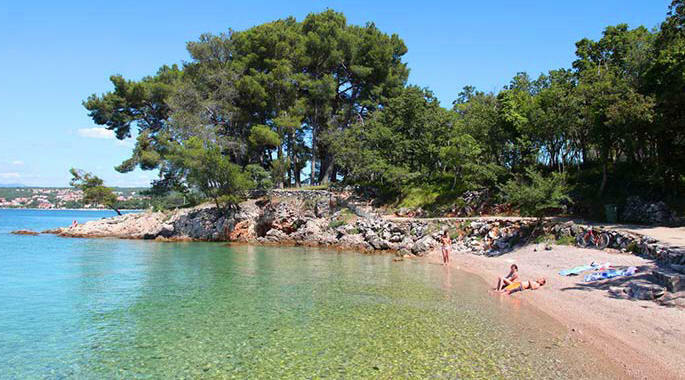 Koralj beach is a fine pebble and gravel beach located east of the Hotel Koralj and stretches towards Redagara (Valda Gara) cove. 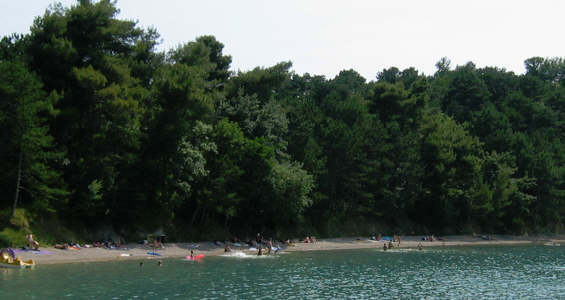 The beach is lined with mature fir trees. 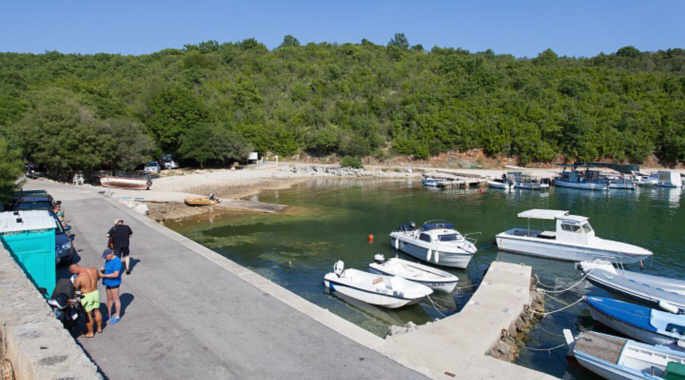 Pets and dogs are welcome on Redagara beach, situated in a peaceful cove further east from Hotel Koralj. 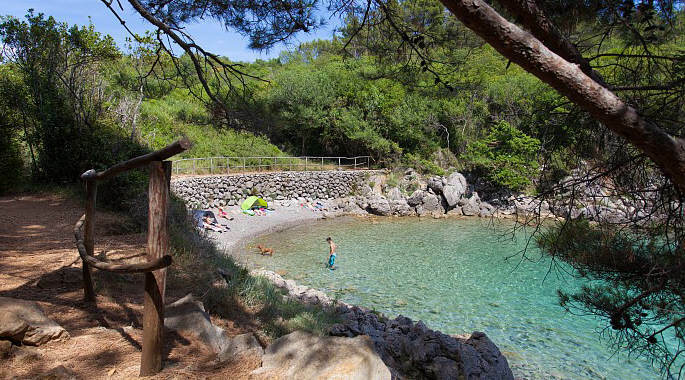 This pebbly beach is surrounded by fir trees with plenty of shade. 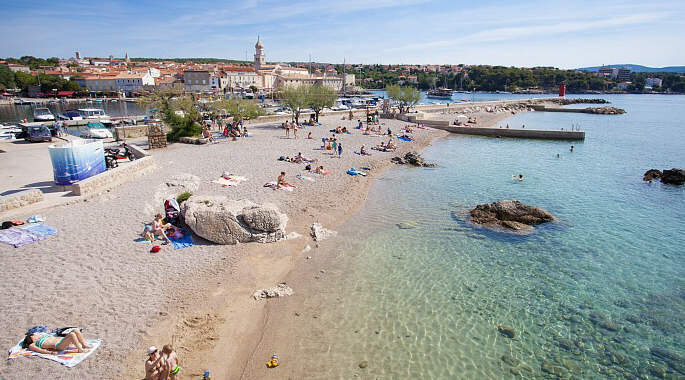 Located to the east of the city of Krk centuries old walls, this is certainly a beach with a view! 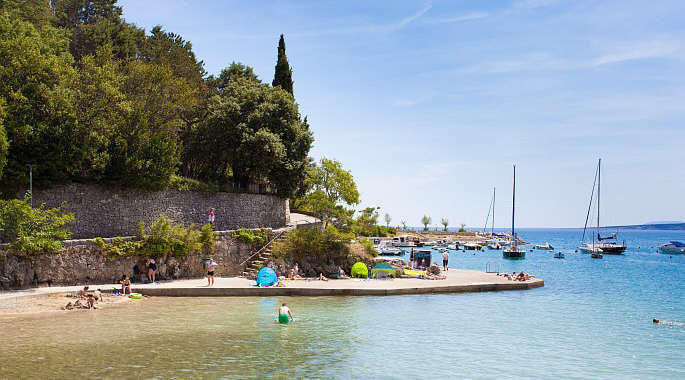 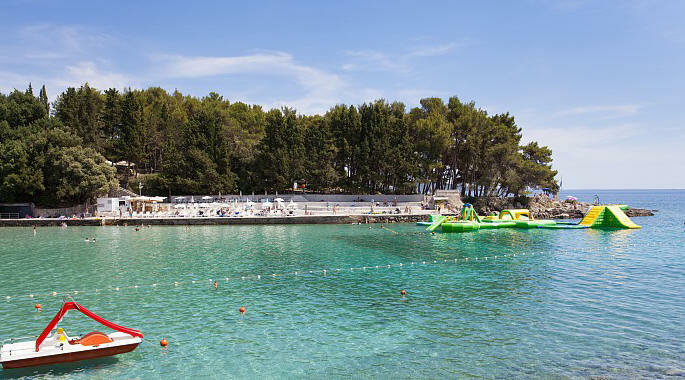 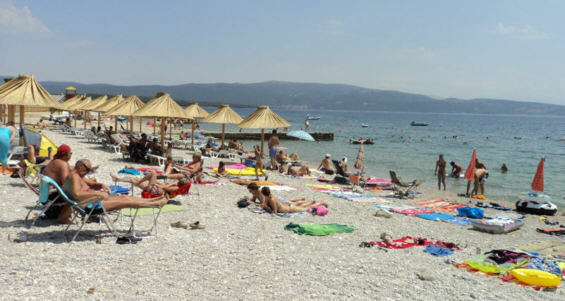 This beach is located below Hotel Drazica and is a mixture of fine gravel, pebbles, paved areas, steps and rocky parts. 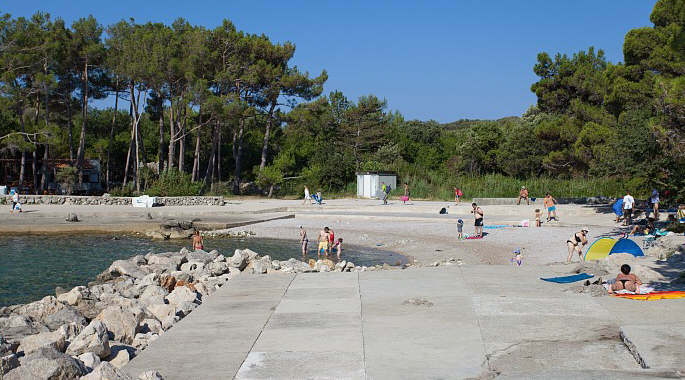 This is a beach of the (now textile) campsite "Camping Krk" (previously Politin) and is situated about two kilometers east of the Town of Krk. 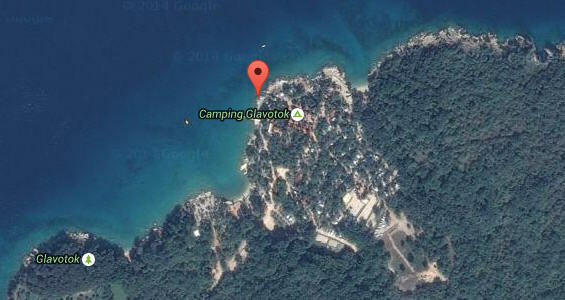 There is a naturist beach nearby. 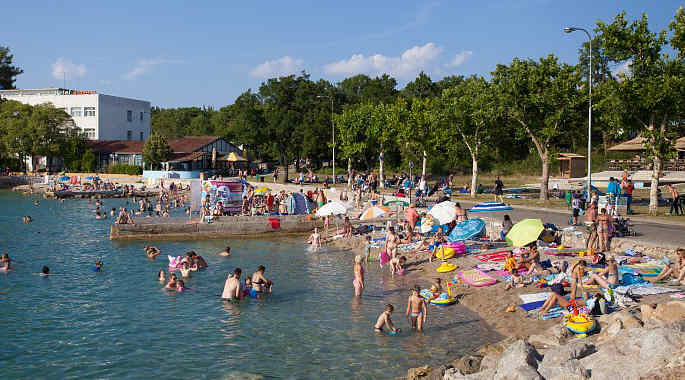 This is the main beach of the campsite Jezevac, situated 10 minutes walk from the Krk town centre. 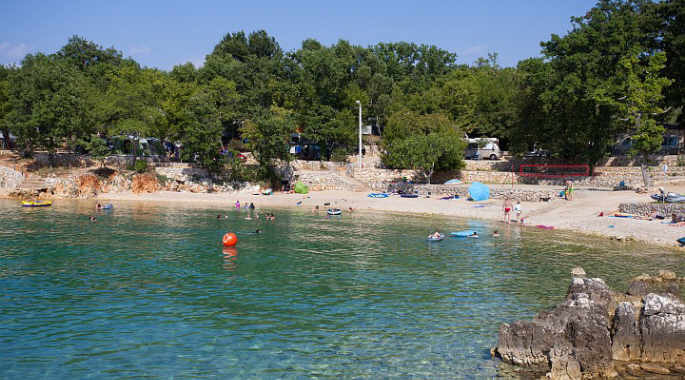 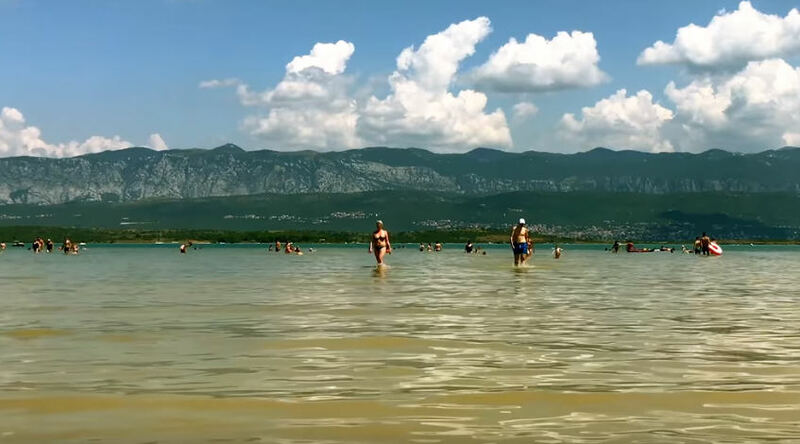 Beach Plav is the most westerly beach of all Krk City beaches and is located near restaurant Karaka, which is to the west of the campsite Jezevac. 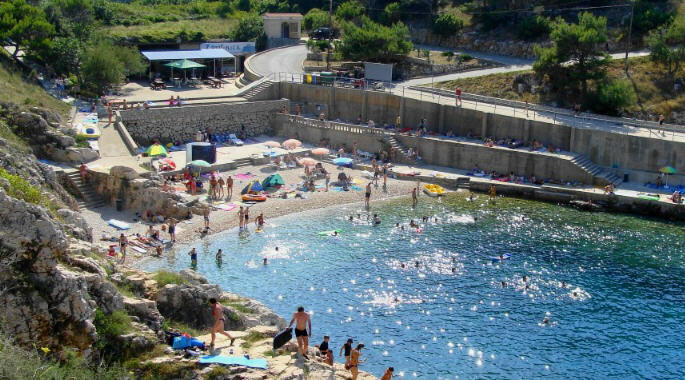 This beach is located below the village of Pinezici, on the western side of the Krk Island, approximately 8 km from the Krk Town, and approximately the same distance from Malinska. 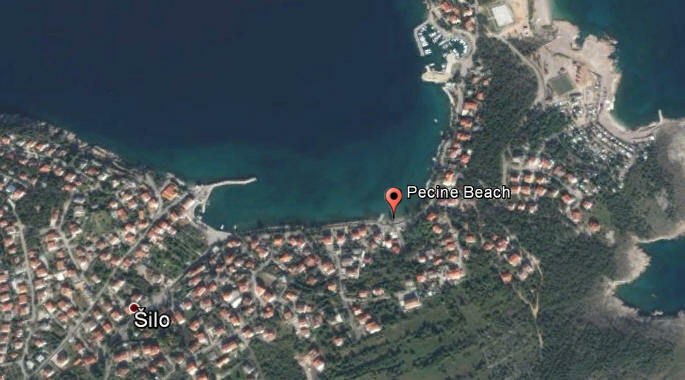 To reach Pinezici village, follow the signposts for Valbiska and Krk-Cres ferry. 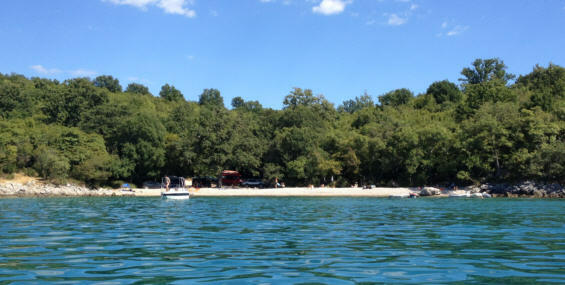 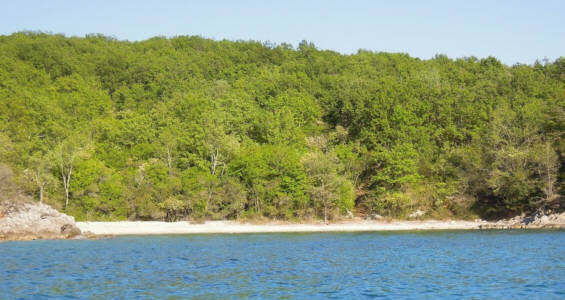 This is one of sandy beaches on the Krk island. 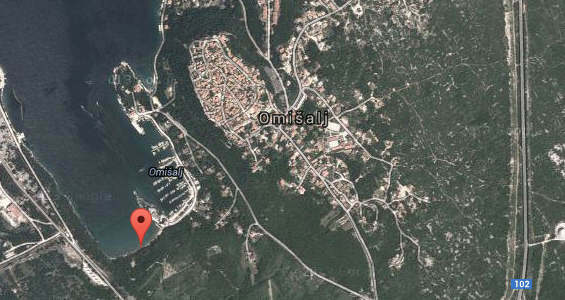 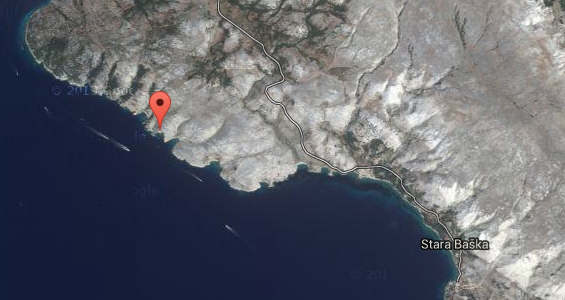 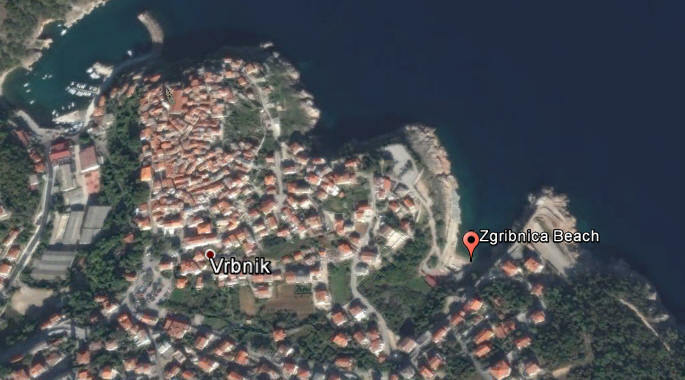 It is located close to village Risika on the eastern side of Island of Krk, aproximately half way between towns of Vrbnik and Silo. 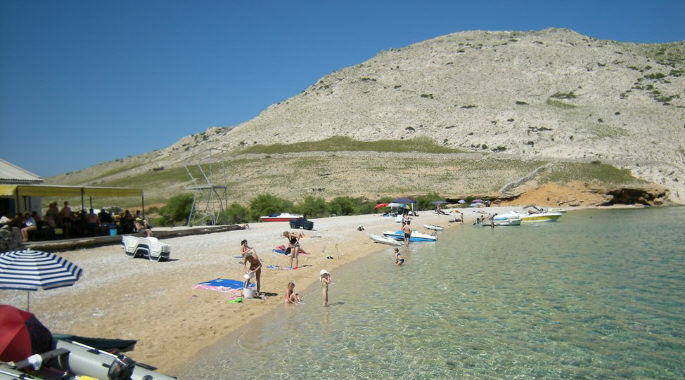 Another sandy beach on the Island of Krk is beach Pecine in the centre of coastal town of Silo. 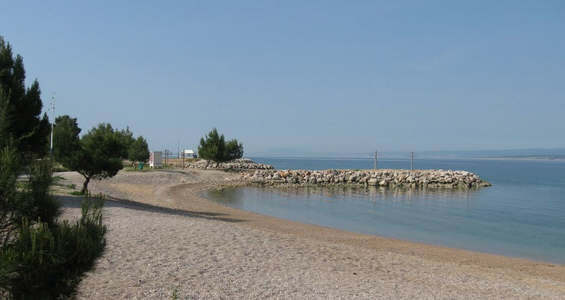 Behind the beach is a promenade leading towards Silo harbour. 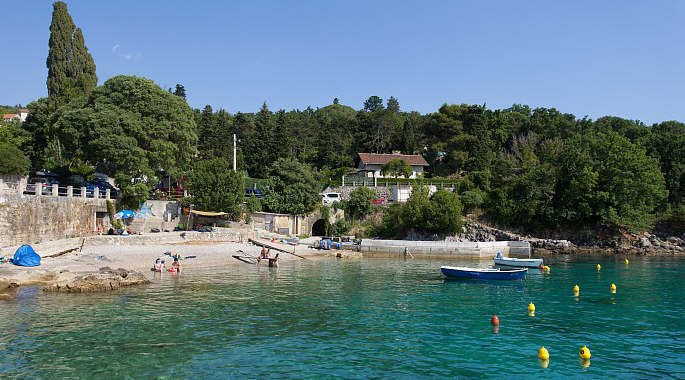 A blue flag beach near Vrbnik on the eastern side of the Island of Krk. 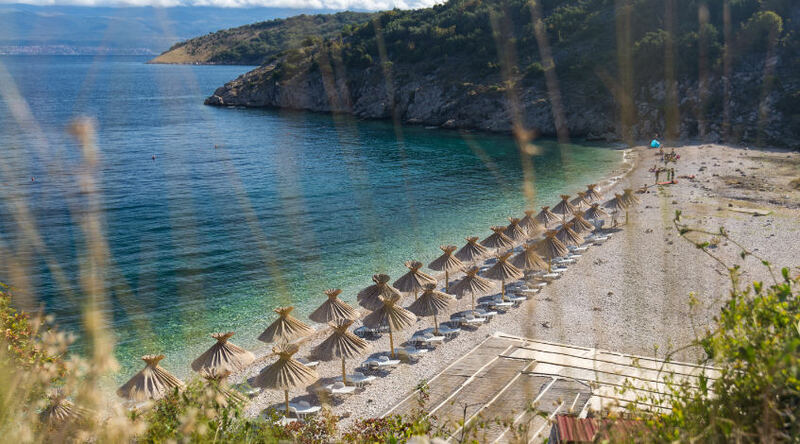 This beach is located on the eastern side of the Krk island, south of the town of Vrbnik. 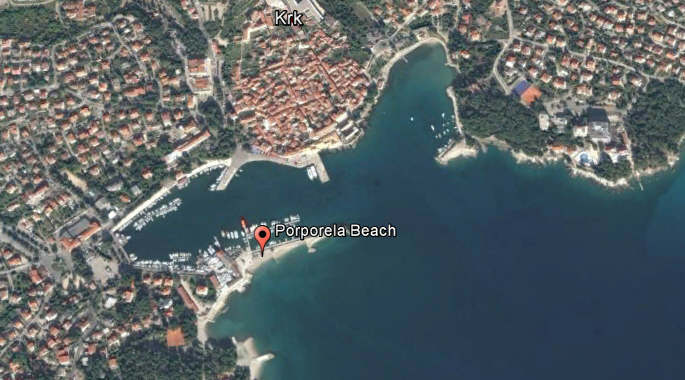 It can only be accessed by car or by boat. 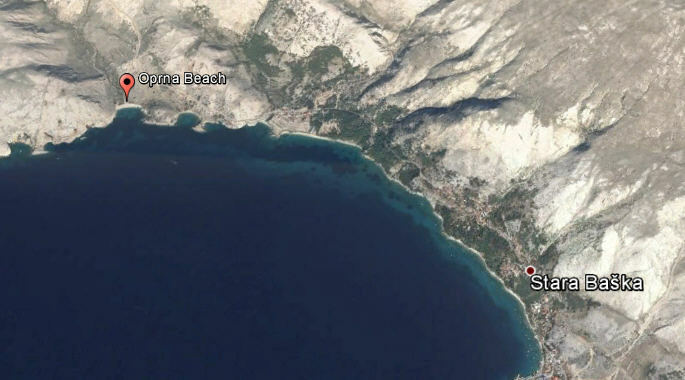 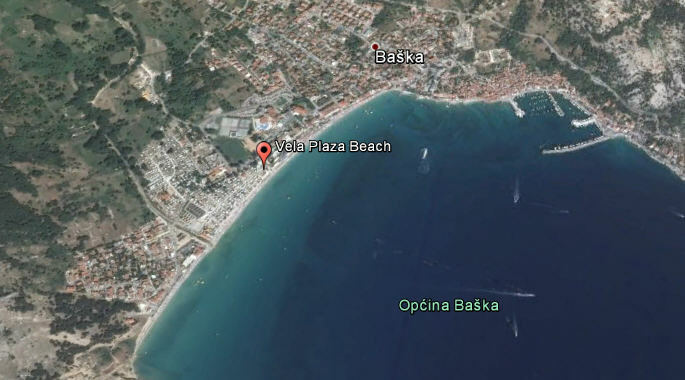 One of the most famous beaches in Croatia, Vela Plaza in the town of Baska stretches over 1800 metres. 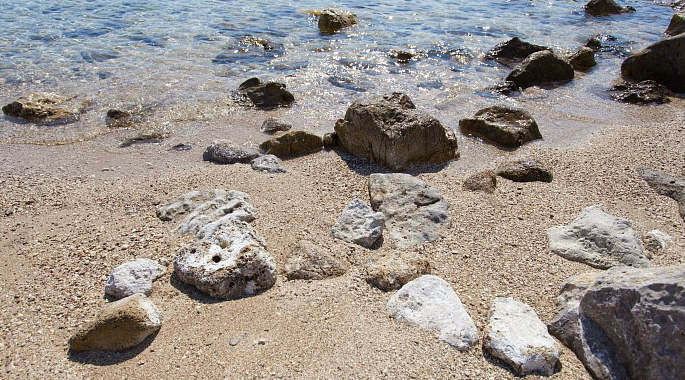 The beach is a combination of pebbles and sand. 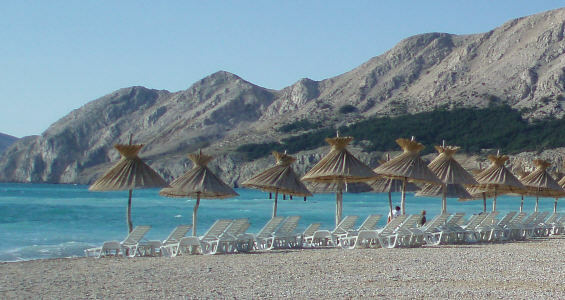 Alongside the beach is Baska promenade with restaurants, caffee bars and souvenir shops. 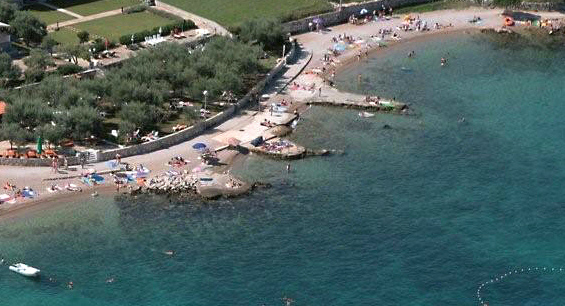 Note that this beach could be very crowded during July and August. 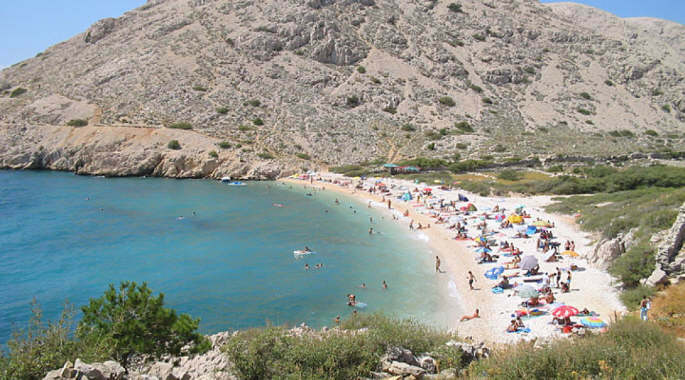 This beach is located near Stara Baska on the southern side of the Krk Island. 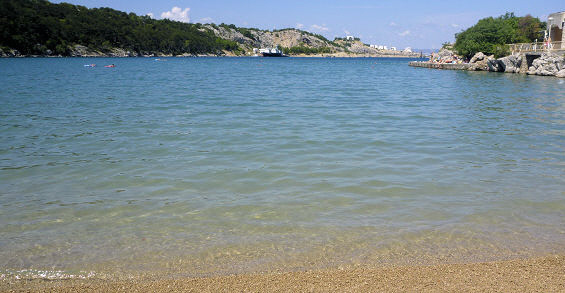 The beach is fine pebbles and sand and is accessible by a boat. 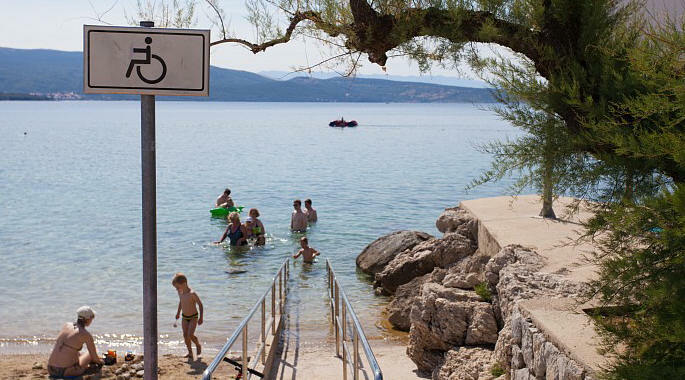 If you are coming by the car, from Punat follow the signs to "Stara Baska". 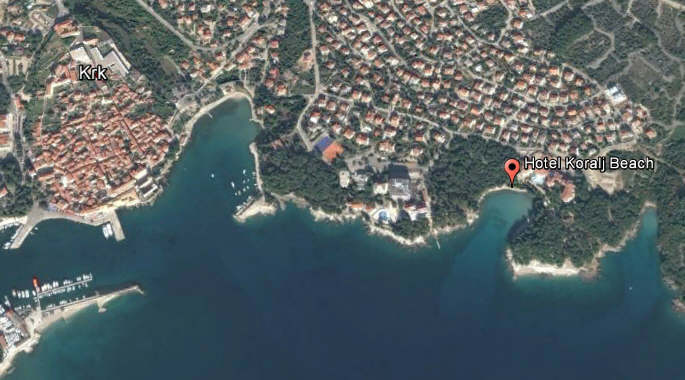 You will have to park above the beach and take the narrow pathway down the slope by foot. 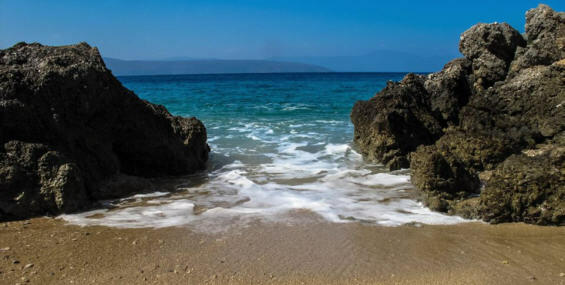 This beautiful beach features a mixture of a small pebbles and sand. 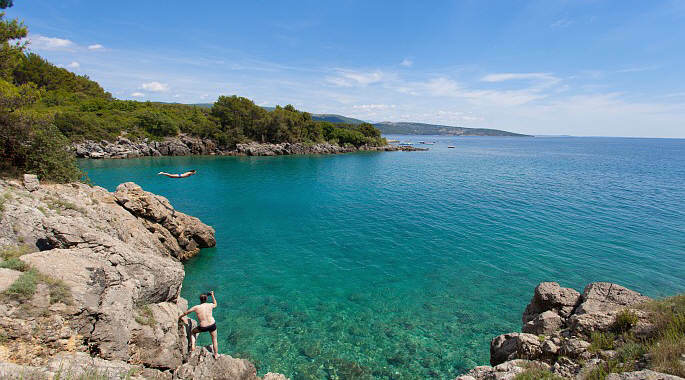 The beach cannot be reached by car and by foot it requires a couple of hours of trekking through karst landscape. 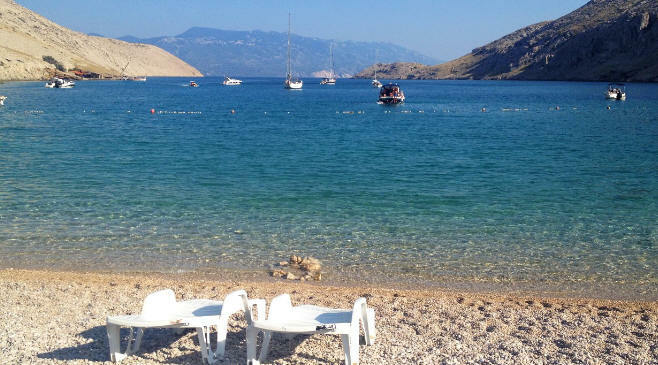 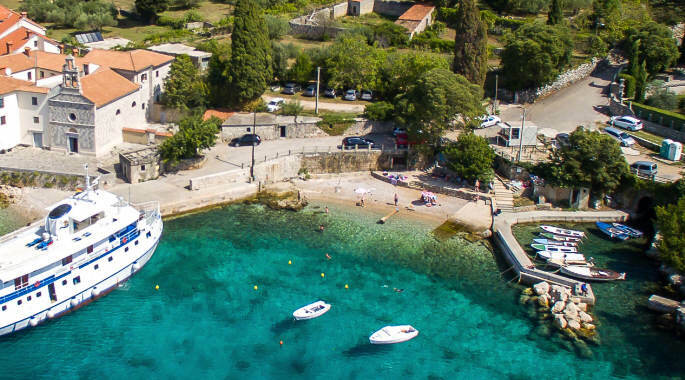 The best way to reach the beach is by the boat and during the summer there are taxi-boats that go daily from Baska to Vela Luka. 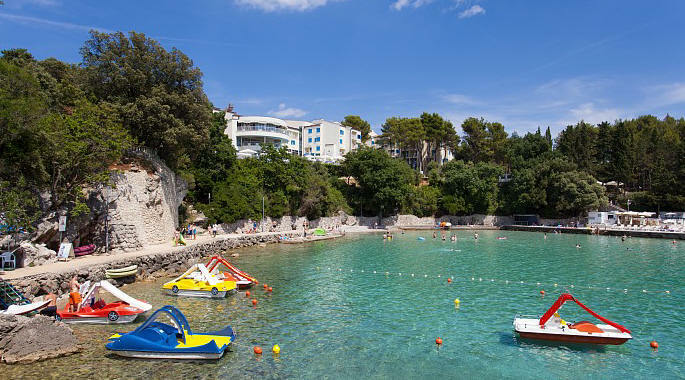 Malin Draga is a small cove close to the centre of Malinska, below the hotel Malin. 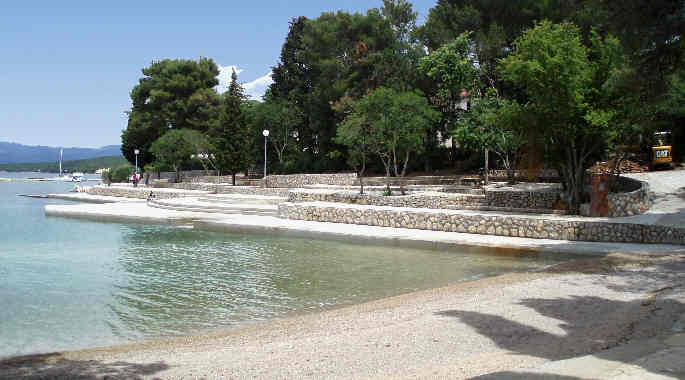 The main beach area is small pebbles, with man-made paved areas nearby. 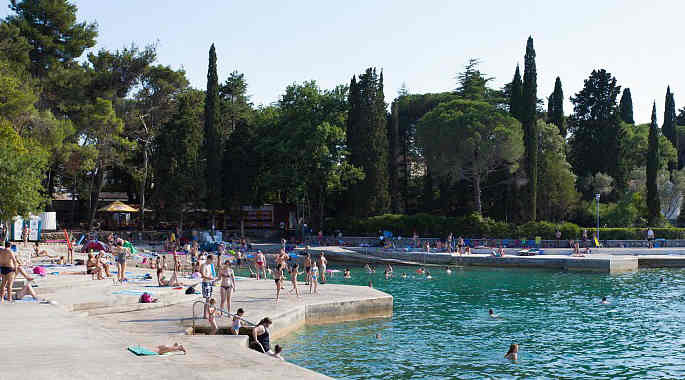 This is main bathing area in Malinska. 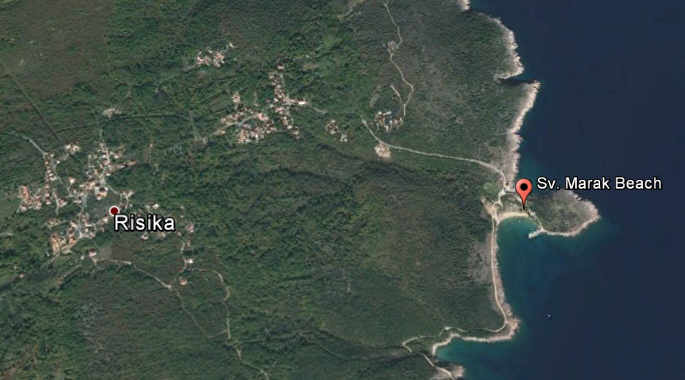 The beach is only metres from the Malinska town centre from where it extends south. 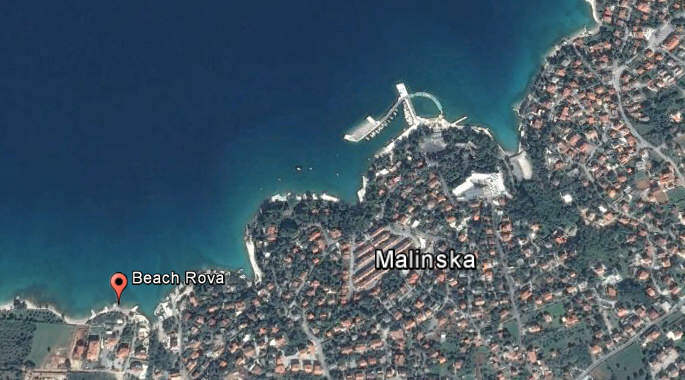 Beach Rova is located below "Villa Rova" boutique hotel in Malinska, aproximately 2km from the Malinska town centre. 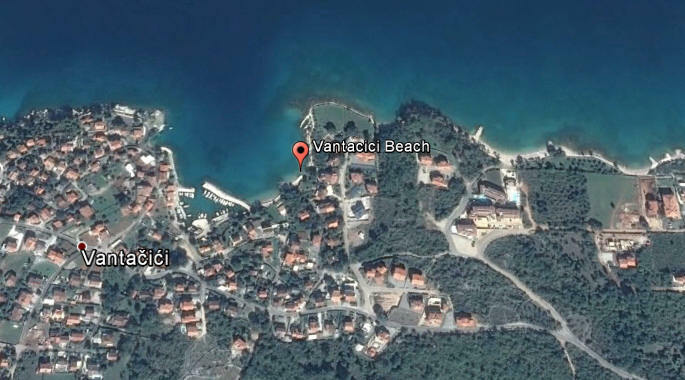 Beach Vantacici is located south of the Malinska town centre, in the residential area called Vantacici. 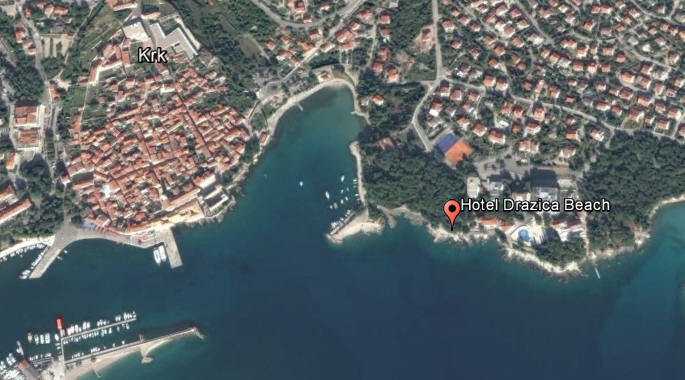 Beach Maestral is located next to the Hotel Maestral, just north of Malinska town centre. 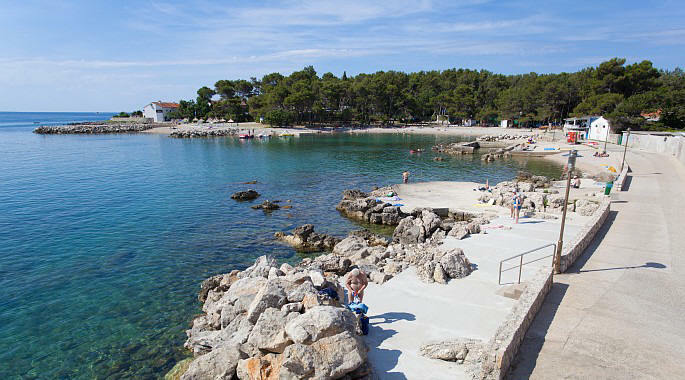 This beach is the main bathing area of Njivice. 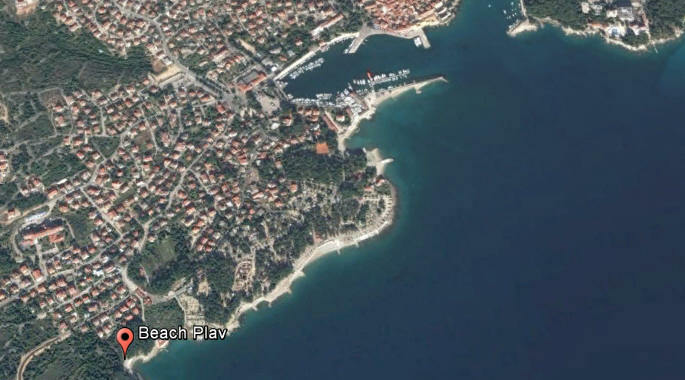 South of this beach are further bathing areas and small coves. 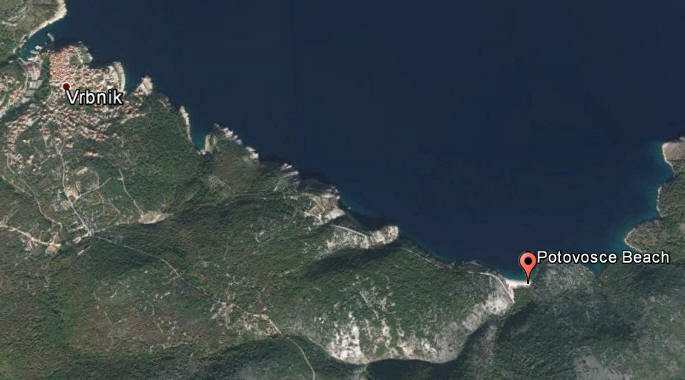 There is a pathway in the shades of pine trees alongside the coast. 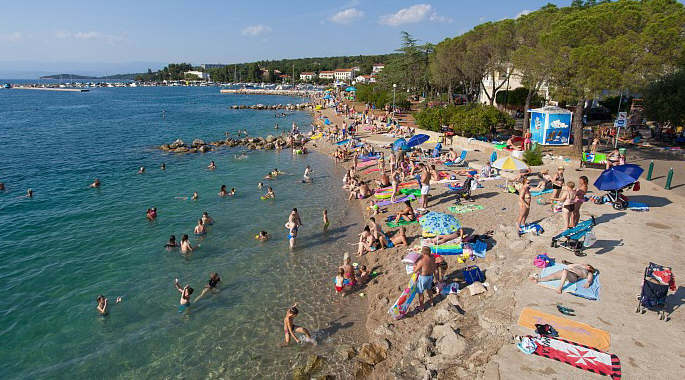 The beach Glavotok is situated on most westernly part of the Krk Island, two kilometers from the villages of Brzac and Milohnic. 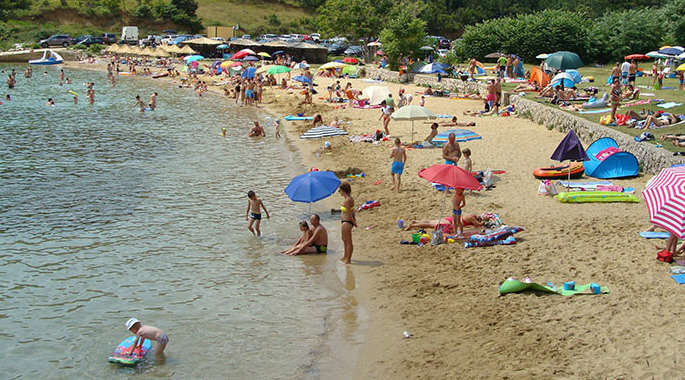 The beach can be reached by car. 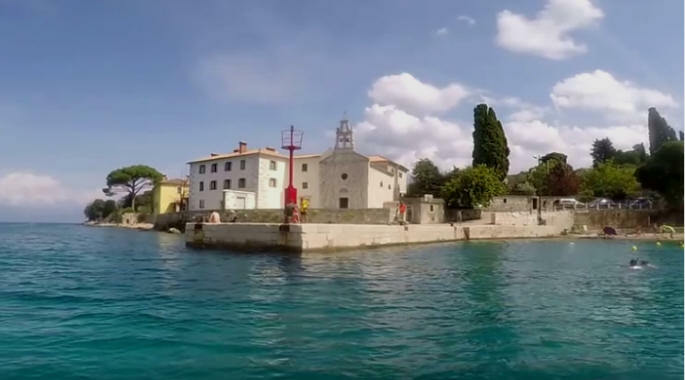 Close to the beach is a church and the Franciscan Monastry from XVI Century. 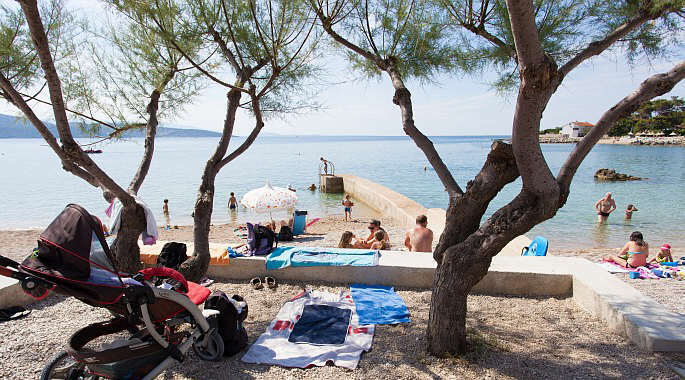 This beach features a small kiosk selling sandwiches, drinks, coffee and ice-cream. 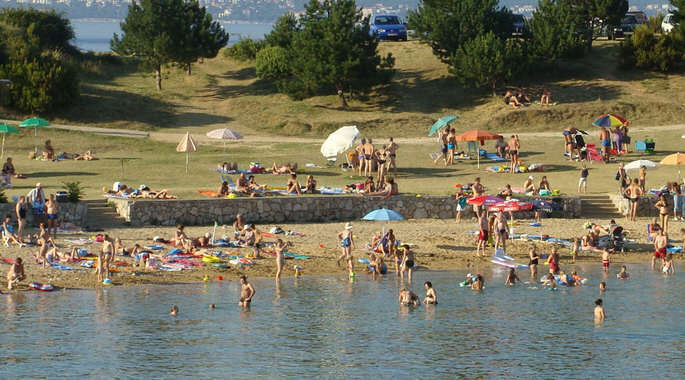 The beach is popular with families with children. 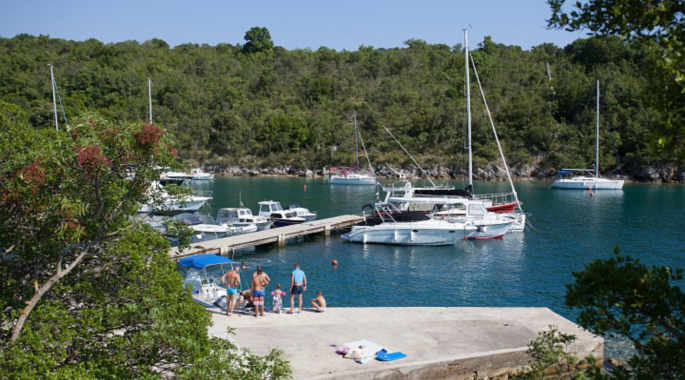 Vela Jana is a deep cove that hosts a small marina and a pier that is used as a bathing area. 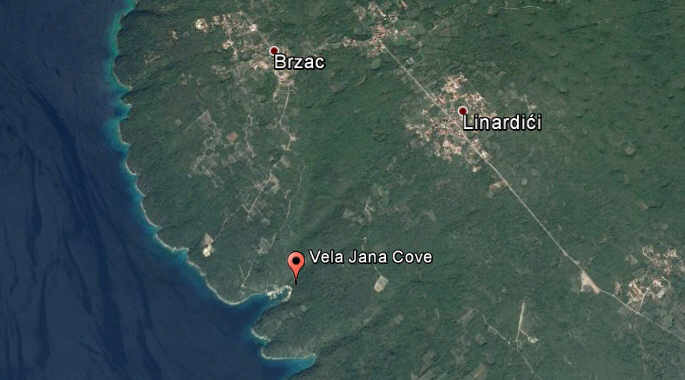 The cove can be reached from villages of Linardic or Brzac using a narrow and steep road. 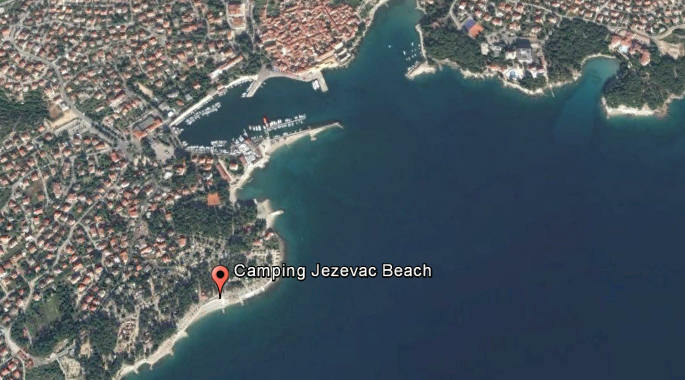 The road is not suitable for camper vans. 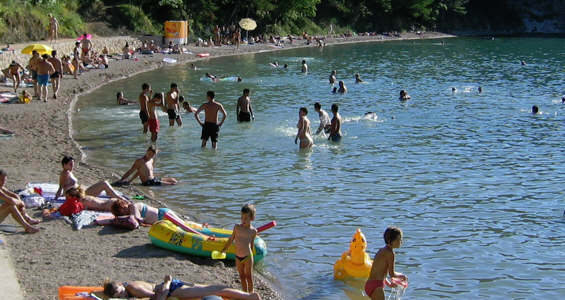 This beach is mostly used by locals. 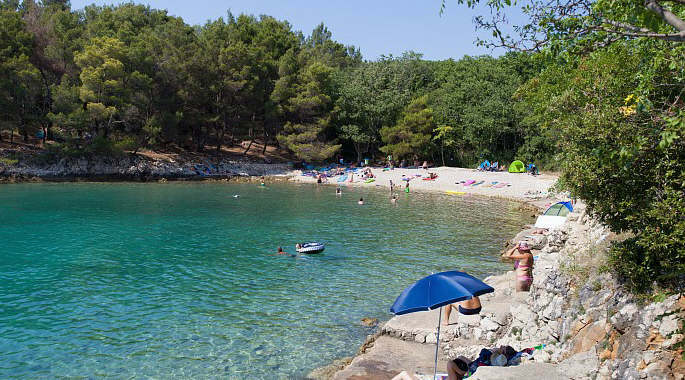 The beach of Eco Camping Glavotok is partially pebbly and partially rocky and is surrounded by rich vegetation comprising of oak trees and mediterranean shrubs. 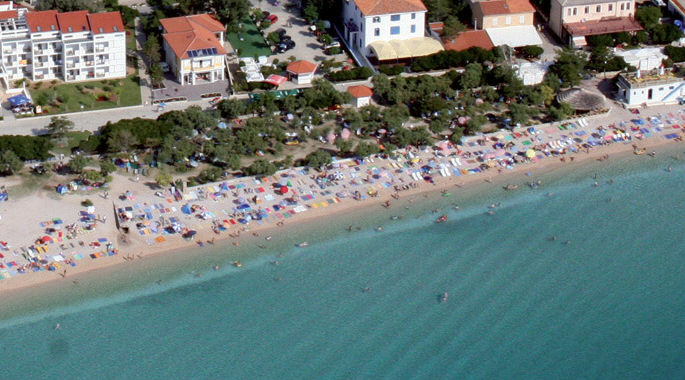 As in every campsite, a beach bar and a restaurant are situated close to the beach. 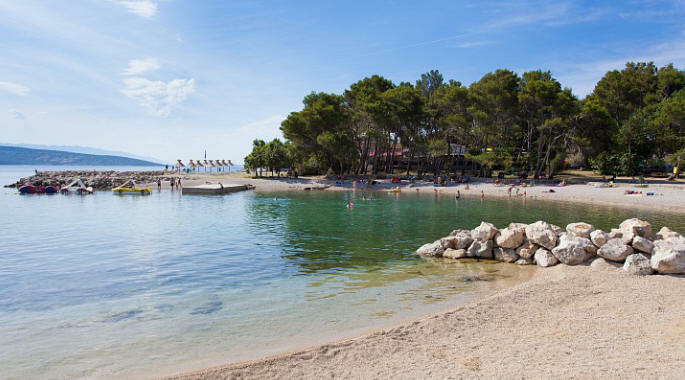 Enjoy this beach and its surroundings in full - the campsite now offers comfortable accommodation in newly built family bungalows. 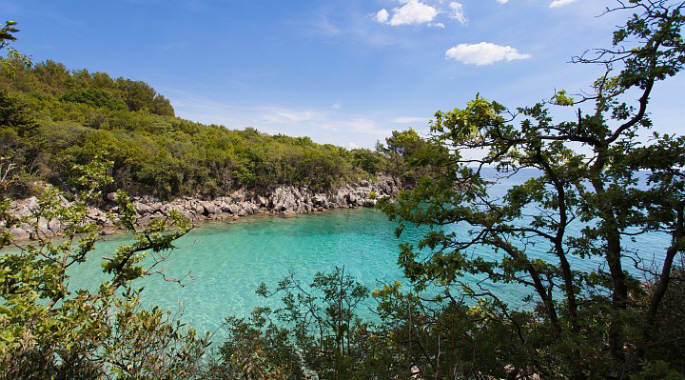 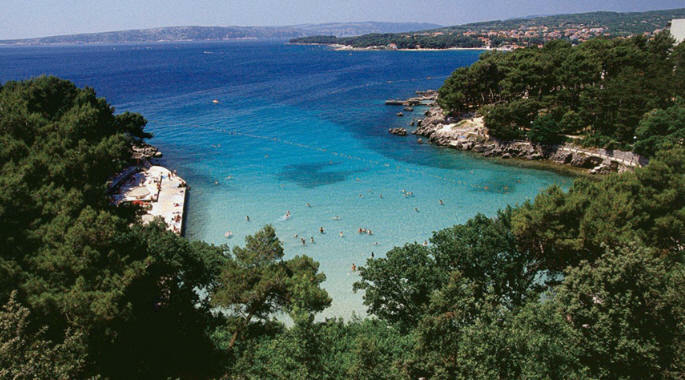 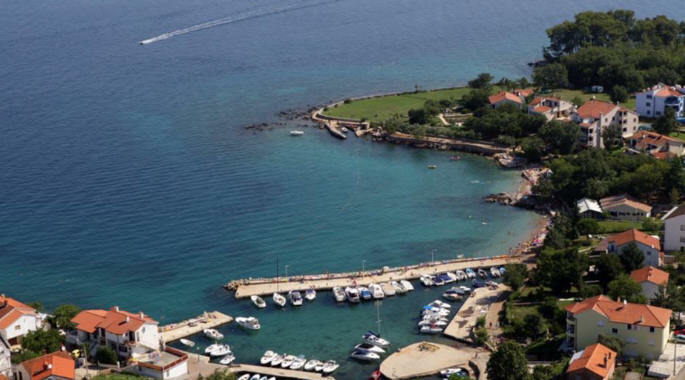 The western part of the island of Krk, popularly called "Sotovento" by locals, is a vegetation rich area dotted with coves featuring peble beaches. 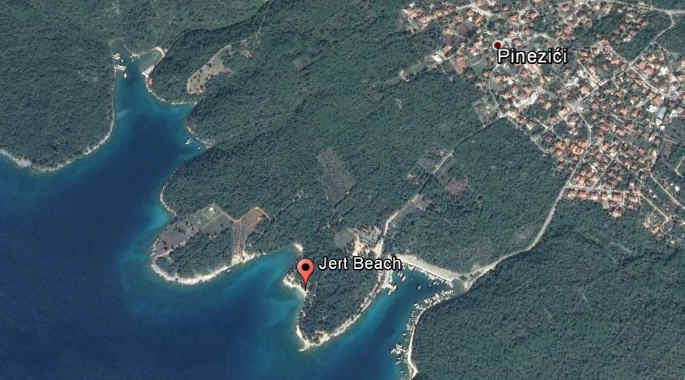 Most of these beaches can only be accessed by the boat and beach visitors are often naturists. 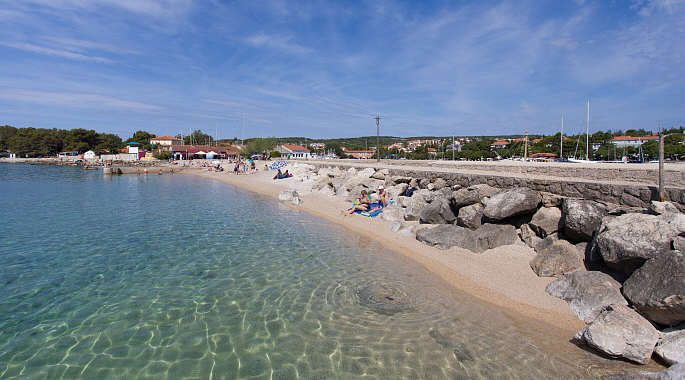 The beach Magneli (Maganel, also called Makneli by locals) can also be reached from the village of Brzac over a narrow pathway. 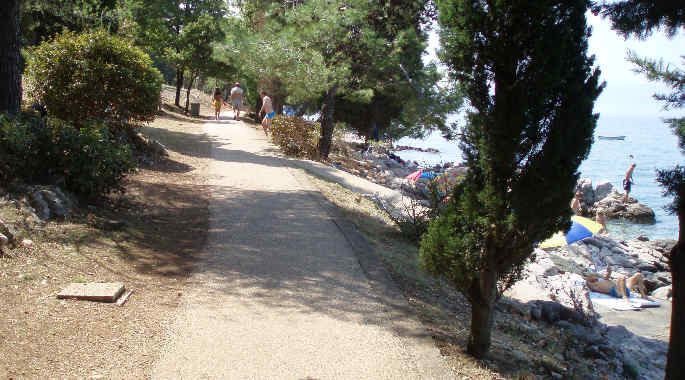 The last 600m is not suitable for cars and has to to be done by foot. 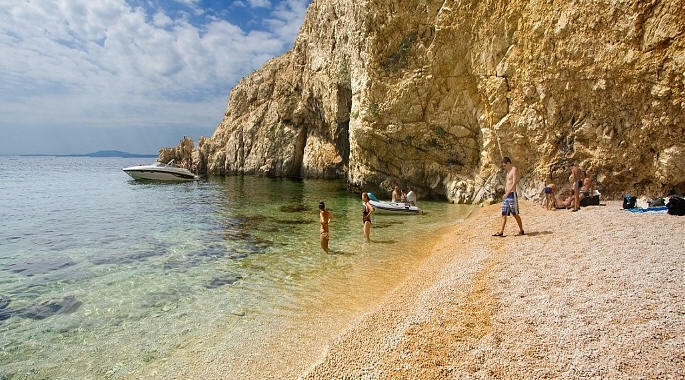 The beach Komostrin is approximately 500 metres south of Glavotok and can also be reached by foot, although the walk is not easy as there is no path and the visitor must walk along the shore over rocky part of the coast. 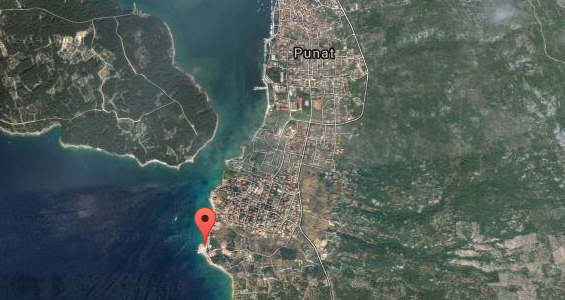 Beach Punta Debij is one of the main beaches in Punat and is located only 200 metres south from the Punat town. 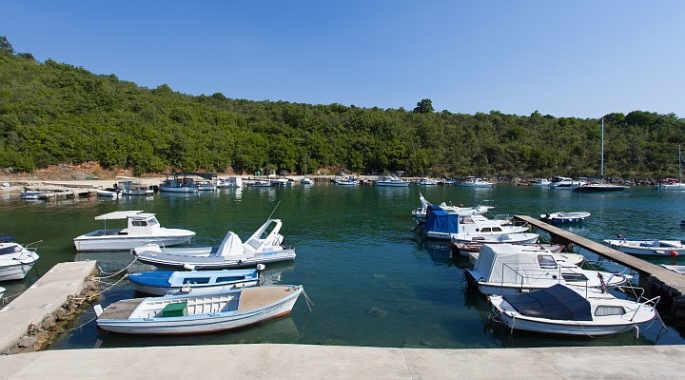 Soline bay is a large bay located on the north-east side of the Island of Krk. 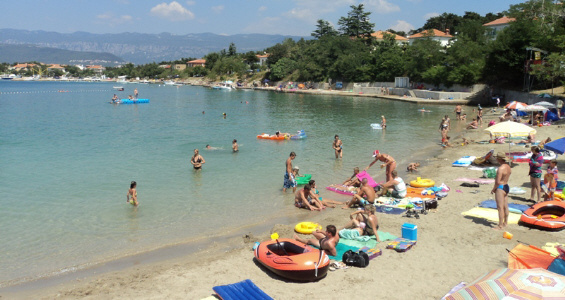 The whole bay is shallow with the average depth of only 3 metres. 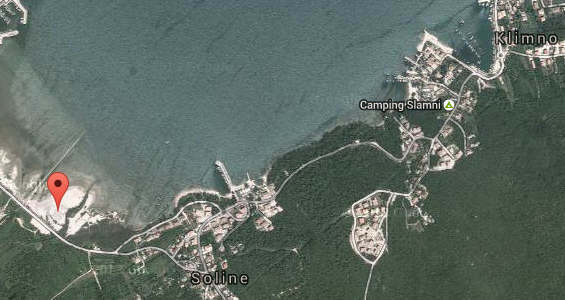 Meline is located on the western side of the bay and the beach features healing mud. 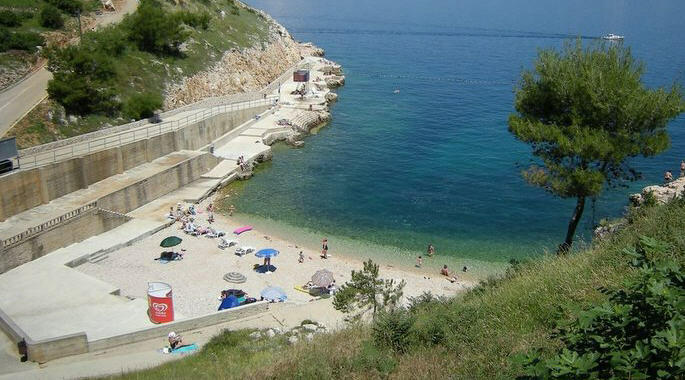 The whole western part of the bay is very shallow and it is possible to walk in the sea more than 50 metres from the shore. 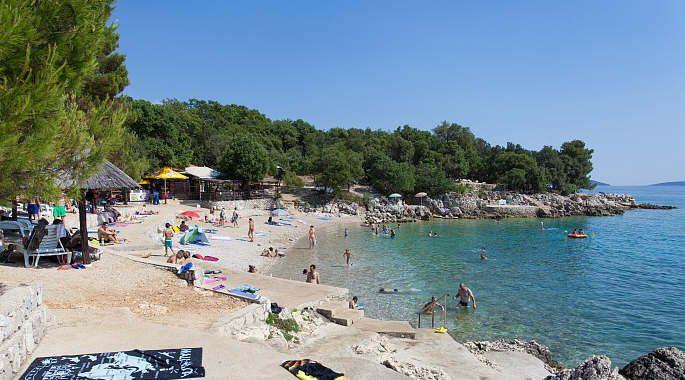 The sea temperature in Soline bay is 2-3 degrees warmer then the sea on other Krk beaches. 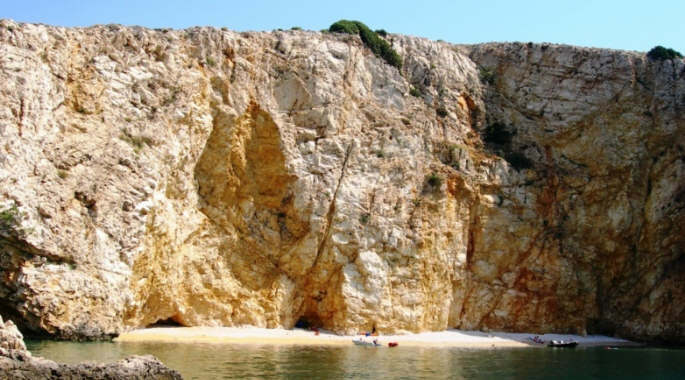 The local name for this beach is "Velo celo" but is more often called "Golden Bay" or "Golden Beach" because of the golden colour of the vertical cliff in the beach backdrop. 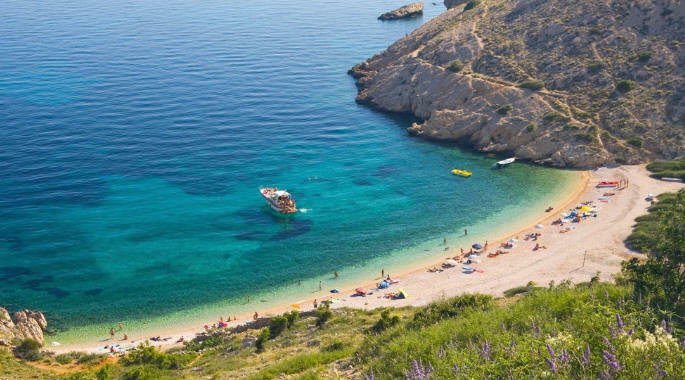 The beach is located on the southern part of the island of Krk, about half way between Punat and Stara Baska and can be reached only by a boat. 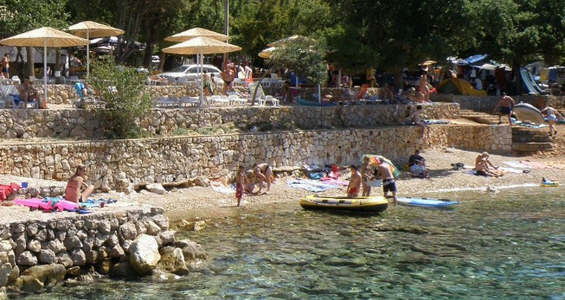 The beach Pesja is a fine pebble beach located at the foot of the clifftop town of Omisalj. 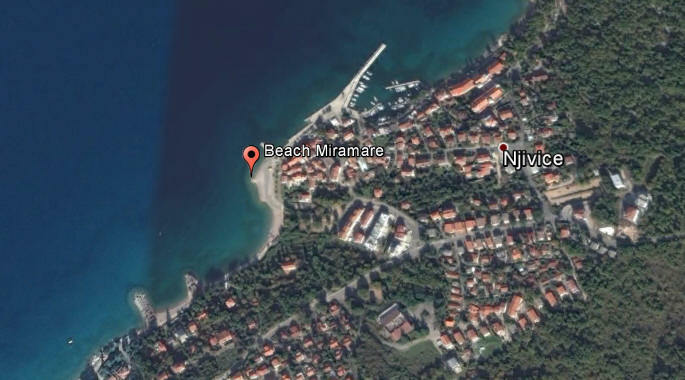 Little bit further away is a beachfront promenade. 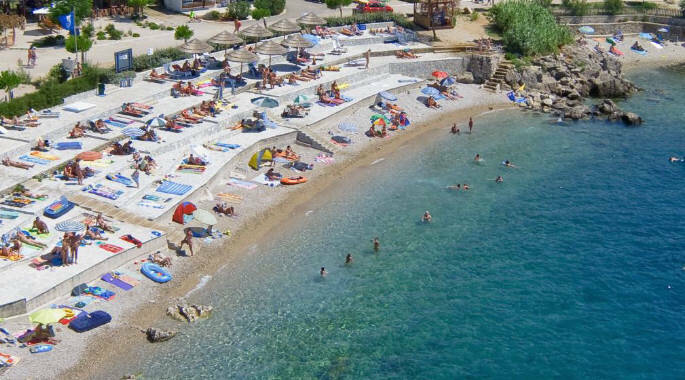 The beach Vela Riva is located in a large Cavlena bay on the western shores of Krk island, half way between Glavotok and Malinska. 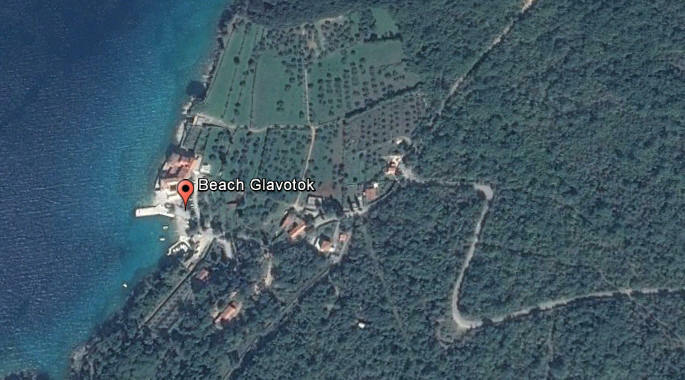 This beach is accessible by car via a narrow road leading from the village of Poljica.